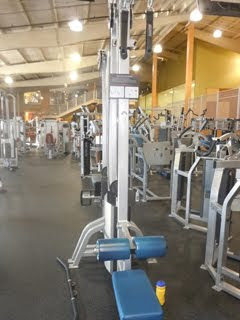 I like the dual pulley pulldown machine, even if this somewhat elongated image doesn't do it justice. The exercise targets the upper back muscles like the trapezoids (the traps), as well as the biceps (the forearms seem to be afftected as well). The two straps that you pull down on are independent, making it less likely that you can develop a strength imbalance. In other words, the machine (in this case a Life Fitness rig), helps prevent one side of your body from dominating the other. Of late, I do a set of 12 X 105#, then one set of 120# as many reps as I can. I thought I'd slide in occasional descriptions of my own weightlifting sessions, to help augment my book, particularly Chapter 8, which covers resistance training. I usually do split routines, in which each session targets different muscle groups – in my case, I have upper-body and lower-body days. The other day was set aside for upper body. I mostly focused on chest, shoulders, and arms. First the bench press. I started off with a warm-up round: 10 X 115#, 8 X 135#, 6 X 155#. You guess it, I was increasing the weight by 20 pounds each time. Then I set the weight at 175# and left it there. I was unspotted, so I almost never do 180 or more while lifting alone. Then I kept going back and forth to the bench (luckily, no one was waiting for it...) to do a set of 4 X 175#. In between, I did some sets of a seated shoulder press with free weights. With this exercise, I found out one of the interesting and valuable aspects of weightlifting – it will pinpoint your weaknesses and help you eliminate them. After going back recently to the shoulder press with free weights, I found out that I had a pronounced weakness in my left shoulder. My left arm could only do five pounds or about 20 percent less than my right (I'm a righty, so that has something to do with it). This didn't seem to make a difference when I did military presses with a bar. So that's one of the special elements of using free weights – a superior isolation of separate muscle groups and parts of the body. When I finished doing my last set of 4 X 175#, I put my feet on the bench and did 20 inverted push-ups. This more or less "finished off" the "pec" muscles for the day.